The road was a little steep but it was a gorgeous day for a ride. Map Man found what felt like a smuggler's route across the French-Spanish border: a quiet little mountain road with only an occasional car. It was another stunning late October day and though the destination of Pamplona was farther off than we'd choose and we could have done without the undisclosed bit of 17% grade, our focus was again on the bright yellows of the maples and the nutty browns of both the oaks and the withering ferns blanketing the steep hillsides. The occasional flocks of handsome, long-haired sheep grazing in the vibrant green pastures kept the drama of the fall colors high. Usually when a mountain pass day includes multiple bouts of elevation loss by going up-down-up instead of up-up-up, I get cranky. Normally I begrudge my hard-won gain being so recklessly tossed away by the road engineers only to be reclaimed by my fatiguing body, but not this day. This day that cranky voice was firmly greeted with "Hush!" as I was intent upon enjoying the idyllic riding experience while surrounded by interesting exposed rock strata and pleasing panoramas. We said our good-byes to France for another year despite no farewell sign from the country as we crossed into Spain at yet another invisible EU border. Bill's GPS confirmed what the concrete bases of an old road gate suggested: we were in Spain. Fresh, new Spanish then Basque language signs greeted us and warned about the speed limits, which of course, were only a matter of curiosity to us. We were only in Spain a few minutes when we began noticing subtle differences between the 2 countries. 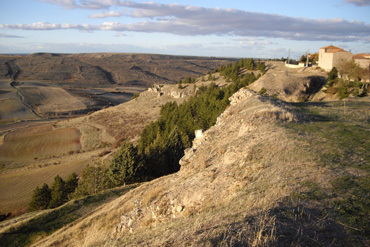 Bill commented that the land was no longer fenced. A small point, but one we noticed. The lack of barriers was more welcoming and added to the day's sense of expansiveness. And from a practical standpoint, it meant it would be easier for us to find discreet places off the road when nature called and we wouldn't risk puncturing our expensive waterproof panniers on barbed wire when leaning our bikes for a photo or rest stop. 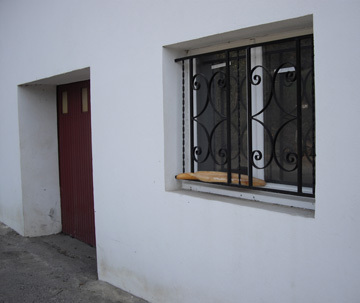 Home delivery: two baguettes tucked in the ironwork. 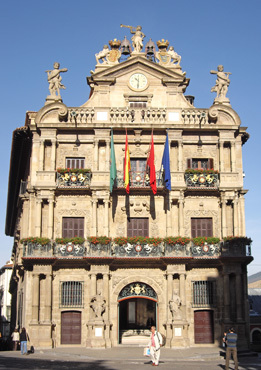 The regimented architectural style in several preceding French Basque Country villages dropped away on the Spanish side though we believe the Spanish Basque tend to be the more militant of the two. But nonetheless, we felt more at ease with a village look that didn't seem to demand such a high level of conformity as appeared to be the case south of Bayonne, France. The French cyclists on the road had ignored us but the Spanish 'roadies' were waving and giving us a "thumbs-up," which was also welcoming. Our trepidation about reviving our lost Spanish language skills quickly melted away as we felt the familiar ease of being in Spain without having spoken a word. One's impressions of peoples and countries is so, so circumstantial, but we've felt this relief before upon arriving in Spain when coming from France. Traveling friends have reported exactly the opposite experience: they have felt a warmer reception from the French. It's a discrepancy I feel no need to reconcile as there is no absolute truth in the assessments--they are different conclusions from a different string of experiences and the incongruities are a good reminder to notice but not to become too attached to one's assessments. We rode almost all of our last miles into the city of about 200,000 on a multi-use path along the Arga River, which was an incredibly sweet way to be greeted by a sprawling city. There we saw the familiar plazas or parks that are so characteristic of Spain and enamor me with their sense of public space and community. Invariably these places have benches and shade trees, a prized combination for daily picnickers like ourselves. Pamplona's old town was quite ornate. Often play equipment for children is included in the squares, as well as ample room for high-speed games of chase. Parents bring their kids to these plazas for a romp when school lets out for the day and people of all ages enjoy the opportunity to connect with others. These plazas are heavily used and seem like a wonderful tradition to support the mental and physical wellbeing of a large number of people in a small area. Once in the city core as on our approach, we continued to feel at ease being in Spain. Our first night in a modest 'hostal' was budget-priced but it had the qualities we love: well-lit, pleasing decor, functional, well-maintained, and requiring little "making do" on our part. On the streets the next morning we again found the Spanish people to be pleasant to be around as they seem self-confident and yet at ease. As before, clerks moved closer rather than pulled away when they said "No" in response to being asked if they spoke English. They don't consider the lack of a shared language a barrier and they didn't make it one. Each time in Spain we've worked to learn and relearn the language and it again felt hopelessly buried under the recently revived French and the Italian that we are always studying. But after looking up a few entries in our electronic dictionary and phrase book, fragments started coming back. Even more exciting was seeing that having advanced our Italian studies to the point of becoming familiar with several tenses and the reflexive form of verbs, we could de-code Spanish in a way that we'd never been able to do before. We were startled to see that even some of the common irregular Spanish verbs followed the same conjugation patterns as are used in Italian. But traveling south from the low end of the Pyrenees and looking onto the rolling hills beyond Pamplona reminded us of what we don't like about Spain, which is the scenery, or lack of it. Outside of the mountains and the northern coast, much of the Spanish countryside is short on eye appeal and it is especially so in the far south. 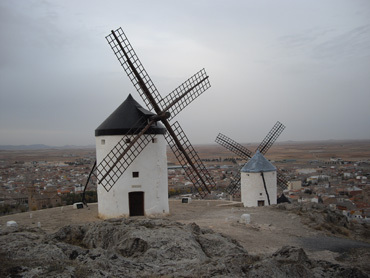 Appreciating the images that there were on the near-barren land: windmills seen from Medinaceli at sunset. 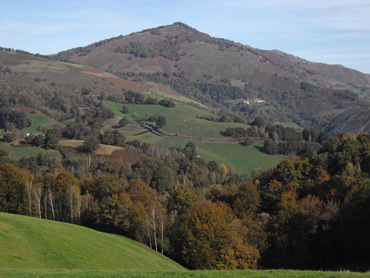 In neighboring France, almost any riding day will deliver sufficient variety in the hills and vegetation to make for a visually satisfying experience, but not so in Spain. We both grew up surrounded by soggy greenery and Spain is just too dried out and too spare to be pleasing to our eyes. And unlike France and much of Europe, the wide-open spaces are too wide and too open in Spain for our taste. Visually, much of Spain is like the US Midwest in that it is too stretched out: the hills are too far away, interesting things to look at are too far between. Typically when taking a photo we strive to have interest in the foreground, mid-ground, and background and that combination was hard to come by in Spain. Hundreds, maybe thousands, of photovoltaic panels. When cresting a train track overpass I called for a pause solely because the landscape before us was exceptional for the area. I needed a pleasing image to hold in my brain and that spot qualified as it had vineyards below us and low hills close enough to frame the image--not an outstanding composition--but the best that was available for hours. As I struggled to be fascinated by the spare scenery on the open road one day, a theme for northern Spain consolidated in my mind, which was "harvesting energy." Over the course of a few hours we'd seen hundreds of modern wind turbines; 2 fields with hundreds of large solar panels; a new biodiesel plant; and a thermo-solar operation. Alternative energy sources seemed to be fueling the new enterprises in the area and adding focal points to the landscape, though not particularly attractive ones. Yard birds: stork nests in the train yard lights. We strained to find objects of interest for our minds to latch on to as the miles rolled by. In this rolling hills part of northeastern Spain, it was overpasses crossing tracks and roads that gave us superior vantage points and another such place was a view over an especially ugly rail yard. 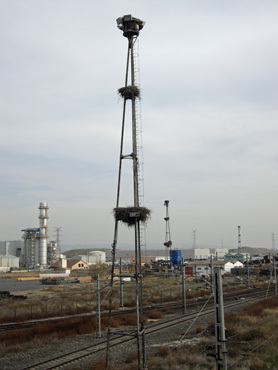 But the buzz came from seeing opportunistic stork's nests occupying 3 and 4 tiers in the yard's light posts. No storks were at home though a few little birds were enjoying the roosts. The sometimes warm-toned, rough-hewn stone work of Spanish old towns always captivates me and we began seeing such facades early in our traverse of Spain this fall. The unexpectedly delightful little town of Olite with its charming stone-faced center was a visual oasis after the blandness of the open country. Bill selected Olite strictly because it had a nice place to stay at the right mileage point on the route, but its tidy though traditional look was a spirit-lifter to us at the end of that day. The stone and iron work was lovely and the enclosed elliptical center created a nicely proportioned urban space. There was a heavily, and I mean heavily, reconstructed Royal Palace at one end that was both cute and a bit forced looking. Olite's charming old town plaza was like an oasis for us. We toured the Palace and learned that its oddly-out-of-place slate covered turrets were likely a folly of imagination as the whole thing had been torched in 1813 to prevent the French from using the Palace as a strong hold. The rebuilding in the 20th century was informed by a design competition and not old sketches, which apparently didn't exist. From the historical perspective, it was the old, egg-shaped ice well outside the reconstructed, 15th c. palace walls that intrigued us the most. The 25' deep well was filled with snow and ice each winter so as to supply the royals with a welcome chill during the heat of the summer. However there wasn't any explanation offered as to how the egg-shaped dome capping the well contributed to its function, if it did. The dome over the 15th c ice well. 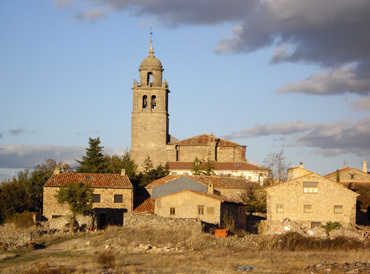 As we left Olite the next morning and again were looking at the open, relatively barren landscape, the image of the village as an oasis in a desert became compelling paradigm for our current experience of Spain. Calling the interior, central plateau region of Spain a desert isn't technically correct and is overly harsh as a descriptor, but the relatively barren quality did keep bringing that word "desert" to mind. Perhaps "desolate" is more accurate. But regardless of the definitions, when we arrived in little villages like Olite, the contrast with where we'd spent our riding day was a dramatic as arriving at an oasis after traveling through the desert. Much of the interior of Spain borders on being a waste land and the sparsely populated land underscored that we weren't the only ones who thought so. Part of the delight of cycling in Europe is that much of the continent is covered by a web of little roads linking hundreds of thousands of little villages and cities. On a bike, that gives the comfort of never being far from somewhere; having a slough of roads to choose from to get there; and seeing a hefty assortment of images along the way. But the traveling experience in Spain is quite different from that in the rest of western Europe. Cycling is more difficult as in much of the country it's a long way to anywhere and there is likely only 1 road going there--and that road will have large trucks on it. Thanks to irrigation projects, there were occasional grain fields; plots of pines; olive groves; and vineyards to gaze upon, but it is hardly a feast for the eyes or a joyous romp for the spirit. As we continued our journey other tiny, ancient villages like Medinaceli and well-preserved, fine old cities like Toledo helped to solidify my sense of them creating an oasis-like experience for us as we pointed our front wheels into their old stone centers at the end of a day of riding on the too-open roads. Certainly not every town in Spain has a charming old town, but we felt a deep pleasure in being cocooned by the ones that did have such a pleasing and reassuring space. Not since being in Scotland during the 2004 Atlantic hurricane season had we been so punished by the winds. It was sooo windy that our average speed for the day on November 3rd this year was lower than the previous day (8 mph) in which we climbed 3000'. All the more telling as this blustery day was a net downhill day. There were a lot of downhills on this windy day but all were discouragingly slow-going. We were pedaling at the maximum of our sustainable effort against the squally wind on 3% downhill grades and couldn't break 5 mph. There was no rest to be had on these descents and the slightest incline brought us to our knees. We both reconciled ourselves to walking our bikes the last miles into town after dark because the journey was taking us hours longer than planned. The land forms funneled the wind in unexpected ways. Luckily there was a little reprieve during the last hour of our ride: a drop in the wind speed and an effective change in its direction allowed us to make it to town as the daylight faded. The only walking was done by me near the crest of a hill when a gouge in the flanking slopes abruptly reversed the direction of the wind. I'd been leaning sideways so severely towards the traffic in response to the new blast that I feared I'd dump over into the path of a truck when the next one went by and temporarily blocked the wind. As it was, the gusts in that area were so fierce that neither of us had tight control over our course. Fortunately, on this particular road the shoulders were wide enough to qualify as parking lanes. Our legs worked as hard as they did climbing to the pass the day before and yet I felt like I'd pedaled those 5+ hours with my arms. The relentless head and cross winds exhausted my arms, shoulders, and back as I rallied all of my might to keep my bike on the road. That night in the mirror my biceps and shoulder muscles looked buffed like a weight-lifter at the gym. My redden face told the story too: despite a heavy coating of sunscreen, my wind-battered skin smarted with the application of lotion. A week later the flakey sloughing of the wind-damaged tissue again reminded me of the ordeal. Nabbing a bit of wind protection for lunch in a rare, tiny village. The upside of all of this effort was that we were getting stronger instead of weaker with winter's approach. Normally the combination of colder weather and decreasing hours of daylight results in us shortening our riding days. 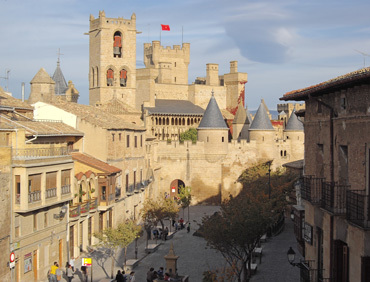 But this November we were in northeastern Spain where lodging is more scarce than in much of Europe. Map Man was nudging our daily distance out beyond our usual comfort zone so as to connect the dots, to make it from one abode to the next. The unexpected surge in the winds meant that our upper bodies were joining in the fitness binge too--no muscles withering like the fall foliage for us this year. We headed-out the next morning to a better day--for awhile. But then the winds kicked up and disappointingly, the road shoulders were half the size as we'd enjoyed the day before, depriving us of our essential "wobble room." The many truck drivers continued to be outstanding in their consideration for us but in return we felt the need to dismount with their passing dozens of times--we couldn't trust ourselves to stay out of their path with the unpredictable gusts. We walked our bikes for 5 minutes at a time to traverse the most exposed, most squirrely, wind situations. Occasionally we'd stop and grip the guard rail to stabilize ourselves as a pack of trucks whizzed by. That night the online weather picture was grim: 5 days of increasing winds over the entire country. The winds were coming primarily out of the west and even far-east and coastal Barcelona was getting nailed. We barely felt safe riding in the conditions as they had been and worsening winds made the thought of riding wildly unappealing. It was "Plan B" time. Plan B in this case meant hopping on one of the 2 daily trains that stopped near our tiny overnight village of Medinaceli. We hoped to ride the train the 150 miles or so to Toledo, but didn't know how far we'd get with the bikes in tow. Luckily our first train, which was out of Medinaceli, accepted bikes--something we only knew when it arrived and we saw the bike symbol on the back car door. At Guadalajara we were able to catch a second train into Madrid and then we were blocked. None of the trains going on to Toledo would ever accept bikes. We quickly settled on taking a different train to the end of its line, which was another 25 miles beyond Madrid to the small city of Aranjuez. That was as far south as we could go with the bikes from this area. 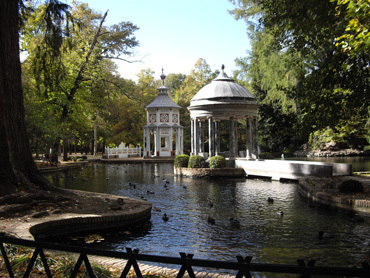 An exceptional portion of the Aranjuez gardens. Finding lodging near sunset would be faster and easier in the small tourist city of Aranjuez than in a mega-city like Madrid. From there we hoped to find a train or bus to finish the trek to Toledo the next day but that was not possible--we'd have to cycle. The winds were increasingly worse each day as predicted and we spent 5 nights in Aranjuez. At about 43,000 people, it was big enough to comfortably meet our needs. Its 300-500 year-old palace and gardens qualified as a UNESCO World Heritage Site--the same Palace gardens that inspired the composition of the classical guitar piece "Concerto de Aranjuez" by Rodrigo. I am personally more moved by his music that the gardens inspired than I was by the gardens themselves and we added walking to the suburban supermarkets to the very short sightseeing list. It was chilly but dry and we felt lucky to be in Spain as Italy, the Balkan Peninsula, and the more northern countries were getting blasted by the soggy side of the storm systems. 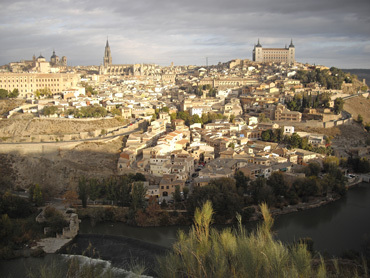 Toledo's medina-like, hilltop old town. Wildly disappointed, we rode back to Aranjuez and began our second trek to Toledo almost 2 hours later, on the truck route. The shoulders were very narrow and the guard rails boxed us in as the big rigs rumbled past us. It would have been harrowing had it been windy; as it was it was only stressful. But arriving at Toledo confirmed our suspicions that it was where we should be to sit-out the next round of winds as Toledo is packed with eye-candy--a top-notch oasis in the visual desert of the Spanish countryside. Lucky for us we had quickly decided to admire Toledo from the exterior instead of from its interiors--to walk the streets instead of press our noses to the glass in the museums--as the exteriors were delightful and viewing the interiors was an exercise in frustration when we attempted to do so. The Toledo cathedral is the big indoor attraction in the city but the $30/2 price tag for the full visit was a turn-off. Spanish cathedrals are 'over the top' and since we'd seen several in the past, we kept our wallets closed. We did however carefully inspect the postcards and the big picture books just to make sure we weren't being foolish. Bill was jazzed about seeing the Visigoth Museum but it was a bust. The building was a 13th c church with a 16th c church add-on exhibiting 18th c documents from the city archives. 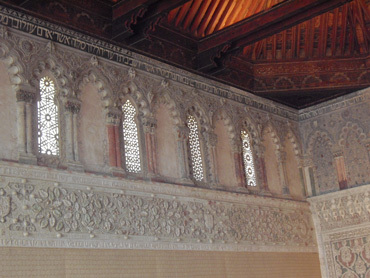 There were a half-dozen stone fragments from the 7th c Visigoths in a niche and copies of several Visigoth votive crowns barely discernible behind a wooden screen and that was it for the Visigoths. From there we went on to the Museo de Santa Cruz to view the El Greco's, but the room with the paintings was closed to the public and the archeological finds displayed outdoors were very basic. Fortunately we already knew that the El Greco Museum itself was also closed, so we didn't add to our frustration by attempting to see it. Our luck with the modern experience was no better when we went to the Toletvm, or Tourist Welcome Center. The free city guide book touted it as "More than a mere information point, this is an avant-garde, innovative space where visitors can enjoy a range of multimedia presentations such as...." We were allowed in the door, but that was it. It appeared that the 2 historical presentations were by appointment only for tour bus groups though the write-up seemed targeted to independent travelers. Dali costumes brightened our gray day. The "expected vs reality" were more closely matched the day before at the synagogue museum in the synagogue, turned church, turned Jewish museum. There we not only got in the door, but we were also able to tour through the spaces. The disappointment there was that information sheets in English for a key room were missing and the staff had no back-up plan to satisfy insistent tourists. Not since visiting Rome one winter had we seen so many tourists in the off season that were readily identifiable by the reference materials in their hands. In Rome, it was thick guide books; in Toledo it was the red-bordered map the tourist office handed out for free. Everywhere we looked in Toledo there was always at least 1 fellow tourist with the hallmark map in hand with perhaps half the people in sight being guided by one of these maps. A Toledo essential: "the" map. Everyone unashamedly kept the map in their hand because much of the time none of us knew exactly where we were. Toledo was very difficult to navigate but we quickly learned we'd soon come upon a place we'd been before so it didn't really matter. One was never really lost but often slightly misplaced. 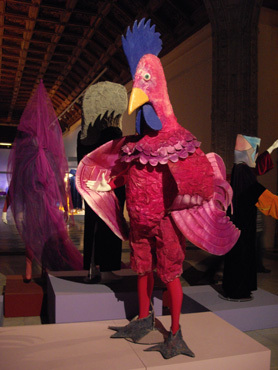 For the motorists wandering on the few streets open to them in the old town, there were the bright pink "Salida ciudad" signs pointing them to the nearest exit from the maze. 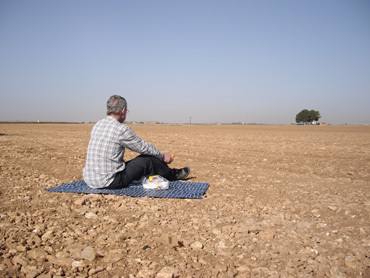 Sitting out the real and some forecasted-but-immaterialized winds for 10 days in the central plains of Spain was a disappointment. We'd been on a roll for pushing up our endurance with longer than usual riding days, which had been a fun buzz. But 10 out of 30 days in Spain off the road destroyed our conditioning peak and shattered any chance of making it to Seville by bike in time for our flight north. But there were some compensating features in addition to seeing Aranjuez and Toledo. One delight in Spain was the consistently high quality of accommodations that were for the most part easy to come by. Unlike in France, we no longer were dealing with tiny, haphazardly outfitted rooms with crazy plumbing and the occasional disagreeable odors emanating from the bedding or walls. In Spain we consistently had nice rooms, good beds, and pleasing decors for great prices. Our only complaints reflected our cultural bias which dictates that windows should be oriented to the streets and not private courtyards. I like to look out and feel the breezes from a window and the more fortified courtyard tradition of the region meant that my kind of windows weren't always the standard. Too bad we weren't able to harness the wind to our advantage. Like in France the budget, though not higher-priced, abodes almost always offered free wifi access, which is huge for us, especially at year-end. We relied heavily on the internet for making the 10 days worth of reservations we needed for our return journey out of Europe as well as lining up several dozen appointments between the 2 of us for our time back home. And the potential for much harsher weather in the fall made daily online checking of the weather forecasts very helpful in route planning. This fall, unlike our previous half-dozen visits to Spain, graced us with exceptional weather for the season. Yes, strong winds ruined enough riding days to destroy the average cyclotourist's entire vacation, but it was often dry. Coming from the Pacific NW of the US where weeks of daily precipitation can obscure the sighting of the sun for as long, seeing the sun everyday in November was a thrill. Many days it popped into the low 70's by mid-afternoon and we relished the seeming extension of summer. Spain's almost 20% unemployment rate was among the worst in the EU and we watched for signs of it on and off the bikes. A failing mall in Toledo was the only eerie site we saw and perhaps its decline preceded the economic crisis. Sandwich boards on the sidewalk promoting "Daily Menu" occasionally had the word "crisis" in it, suggesting that they'd slashed their prices or were offering a new, budget-sensitive special. We wondered if the pain of the crisis was invisible to us or perhaps the southern coastal, more touristy region where condo construction has been huge may have been much harder hit. What did catch our attention more than signs of crisis in the Spanish economy was the building spree it seemed to still be on. In prior months we'd seen TV stories about stimulus plans in Spain focusing on construction projects and there was building activity everywhere we were. Residential projects were the current rage with freeway construction having been the previous focus. It was definitely hard times for picnickers in central Spain. There had been so much recent roadwork that Map Man and Garmin (GPS) were frequently consoling each other after coming upon yet another freeway that wasn't shown on Garmin's 2-year old maps. Spain was the only country in which it was an issue and it was recurrent. New freeways had sprung-up out of nowhere all over on our route. Curiously, many of these freeways seemed to be ahead of their time as some were barely used. We paused on several overpasses to assess if the freeway was even open as there wasn't a vehicle in sight. After waiting several minutes, we'd finally know by the passage of a few cars that it was indeed completed and in use, but not by many. At the toll entrance to one we paused to decipher the reader board message. We thought perhaps it was closed because of a fire but instead they were promoting the fuel efficiency of their fine new asphalt strip. Towards the end of our stay in Spain when we were forced to take the trains to make up for lost time, it became apparent that rail construction was another aggressively funded project. Spain is committed to installing new high speed rail lines, with many already in operation. Unfortunately, when they complete a fast line they drop the regional service, which means yet another segment of Spain isn't accessible to cyclists needing a Plan B and the ticket price seems to at least double. 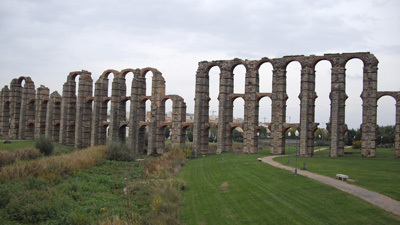 The ruins of Mérida's stunning Roman aqueduct. The small city of Mérida is close to the Portuguese border but conspicuously far from anywhere else. 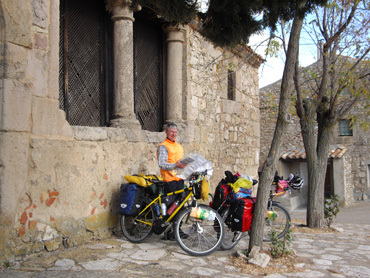 We unexpectedly took a 5 hour train ride from the town of Manzanares to Mérida as a finale to our 2009 cycling season when we discovered that yet another new high speed train line had foiled Bill's plans. 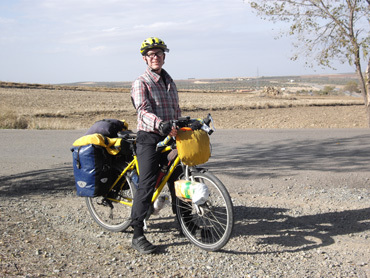 We had headed out in the morning expecting to ride several more days and then take a train when we were closer to Seville. But suddenly yesterday became our last riding day of the season and it would be train travel from there on out, except for some commuter riding. We'd thought that Mérida was destined to remain on our "Must See" list for at least another year so it was a shock to be on our way there. But Mérida was on our radar because of its Roman ruins, which are indeed very fine. And after passing by a visit to Toledo's cathedral for $30, we were thrilled to be able to visit all of Mérida's many Roman sites and the museum for the same price, which felt like a real bargain. And it was in Mérida that we doubled our experience with 2 new concepts this year: ice wells and Roman dams. 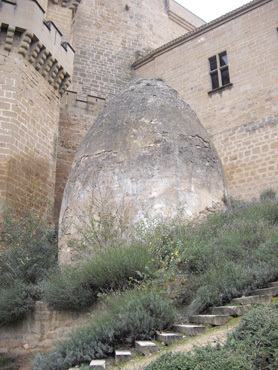 We'd seen the protective, egg-shaped dome over Olite's ice well tucked behind the 15th c palace but it was in Mérida that we saw underground ice storage on a Roman scale, as it was an ice warehouse. Some time after Olite we'd tracked down a long Roman dam in ruins but outside of Mérida we saw a Roman dam still successfully forming a reservoir. None of them made for great photos, but like avid birder's, we noted them as trophy finds on our mental lists of predecessor technologies. Our visit to Seville this year was a business trip rather than a sightseeing event as Seville was the official ending point of our touring season. Fortunately we'd planned plenty of time to complete all of our homeward-bound chores because, as feared, everything took longer than expected. Printing out our boarding passes and vouchers for the next week should have been a snap at our hotel that provided free wifi, free internet, and access to a printer. But this was one of those times that their printer mysteriously would print any color except black and we didn't want to risk problems with scanners or clerks on our upcoming, carefully calibrated, long-distance travel days. That 5 minute printing job was instantly transformed into a 2 hour search for an internet shop. The first one's printer wasn't working; the second shop was totally out of commission for at least another hour; and nobody really knew where we could find their competitors. 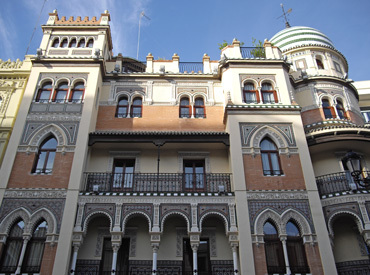 We enjoyed Seville's architecture while on the run. Locating a pair of inexpensive suitcases was an all day job, which was a disappointment but not a surprise. But we were aghast when the wide sidewalk across the river to the Carrefour "Hipermarket" abruptly stopped. We toughed it out by scooting along the shoulder and traversing a couple of freeway exits to ride the remaining mile to the store. Prudence won out for our return trip and we traveled a less exciting 12+ miles to make the 3 mile journey back to the hotel more safely with the nesting suitcases strapped on my bike rack. The tight weight limits on the intra-Europe budget airlines means shaving every ounce to 'make weight.' That process starts by buying ultra-cheap suitcases at giant supermarkets such as Carrefour because they are the ones who sell ultra-light products. No sense in consuming half your weight limit with an empty suitcase, which is too easy to do. We've learned that in the low-end luggage lines that the price directly correlates with the weight: the larger of the 3 in a nesting set of suitcases for 18€ weighed 2.8 kg, the next available suitcase of the same volume weighed 4.6 kg and sold for 45€, and the flashier 65€ version was heavier still. One doesn't have to bother with the conversion of kilograms to pounds or Euros to dollars to figure out the double penalties of weight and price. We've also learned through experience that the durability of all of the low-end suitcases is poor, so cheaper is better. Anticipating a huge potential for glitches, Bill had worked through most of the problems via email in advance of renting our storage locker in Seville. The cheery and enthusiastic woman's English was more effective in person, which was a relief. Her use of personal pronouns on emails was chaotic and we learned to leave any reference to "you," "he," or "us" blank for ease of reading. At the office, we skimmed the contract written in Spanish, relying heavily on the similarities between Spanish and Italian while she did her best to describe important restrictions like no guns, explosives, or hazardous chemicals. As is the case every year, doing the "Big Sort" was tedious, stressful, and too hurried. A little less than half of our gear would go back home with us in our flimsy suitcases; some items to return and others making a 1-way journey. Other treasures would sit for 3 months in the storage locker and then be scooped up for a side trip to Morocco whereas the bikes and the remaining gear would be in the storage locker for almost 4 months. We quickly longed for the quieter lifestyle on the road. As rushed and as stressful as our preparation work was for leaving our bikes behind in Seville and continuing home as suitcase travelers, our initial phase of actually being in transit was harsher yet. For some strange reason the train clerks were assigning the majority of the passengers on our Sevilla to Malaga run into a small area in the train, so what could have been a comfortable 3 hour journey left us stressed from being overheated and overcrowded. Already a bit frayed, we were greeted at the newly remodeled Malaga train station with a barrage of noise. It was too loud in every way: clatters, clanks, rumbles, and buzzes gave us a case of the jitters. We rushed towards the door, looking for a way to escape the insults but we had to exit through a screen of cigarette smoke first. Once outside, the construction and traffic noise deprived us of any relief. With no refuge in sight, Bill waited with the bags in the quietest place he could find while I visited the nearby giant mall to buy groceries, which continued the sensory overload for both of us for another hour. When we wished we were eating a simple dinner in our quiet room, we had one more trek to make that day, which was on the local metro to our hotel near the airport. The expected short walk to our hotel took over an hour while we waited for a bus as more noisy construction work had wiped-out the pedestrian access. Then it was a dusty, gritty walk along the noisy freeway to make it the last few hundred feet to the door. We were both in melt-down phase when we finally arrived. Clearly our tranquil cycling life had de-conditioned us to the stresses of modern living. Fortunately, once we arrived in Germany our travel legs within that country and on to Amsterdam would be more genteel. But there was no denying that we were on our way back to the real world, back to a busier, noisier, and more rushed life at home for 3 months before we'd be on the road again in the spring. Bill's meticulously crafted plan of 2 flights; 2 three to five hour train trips; and an assortment of short and long bus rides over the course of 6 days returned us safely home on schedule from Seville. Our extra day in Amsterdam 'just in case there is a problem' wasn't needed and we spent a relaxing day walking in the village neighborhoods near our airport hotel and doing chores. Once we cleared security in Portland, we lingered at the terminal long enough to use its free wifi system to upload this journal and send out our emails. The next day we planned to hit the ground running--as best we can in the fog of jet lag--to begin checking things off the list so as to get us back to the airport in early March 2010 to begin Touring Season #10. But in the meantime, you'll receive one more invitation to read about our 2009 adventures in the annual "Looking Back" piece in which we reflect on 2009.